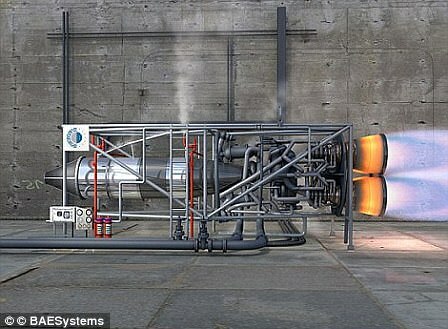 A revolutionary engine that could be used in a spaceplane to take passengers into space in just 15 minutes has taken a major step forward with a new testing facility in Colorado. 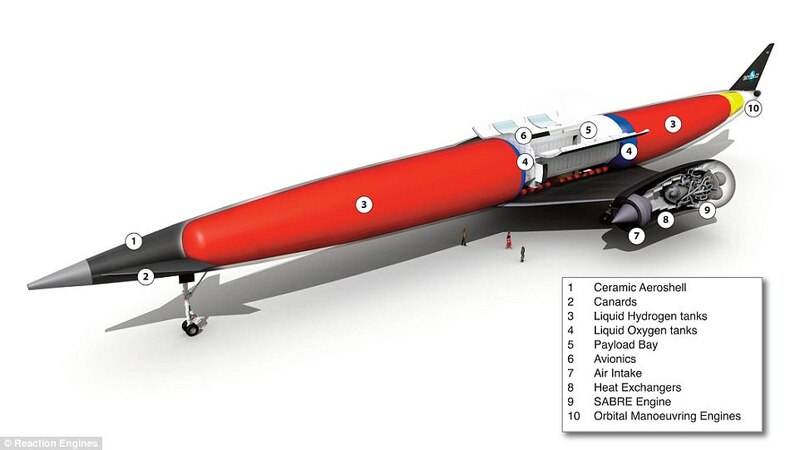 The site, at Front Range Airport near Watkins, Colorado, will test a key technology in Reaction Engine's hypersonic air-breathing combined cycle Sabre rocket engine. It comes after the firm won a U.S. Defense Advanced Research Projects Agency (DARPA) contract to test the engine’s pre-cooler heat exchanger, or HTX. 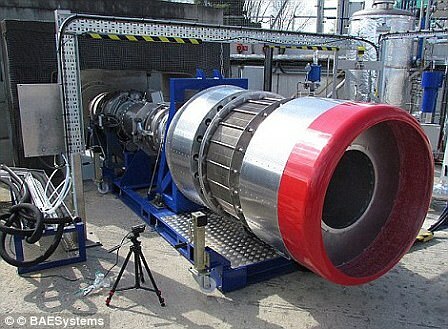 In the UK the is continuing to develop the TF1 engine test facility at Westcott where the first ground-based demonstration of the Sabre rocket engine will take place. 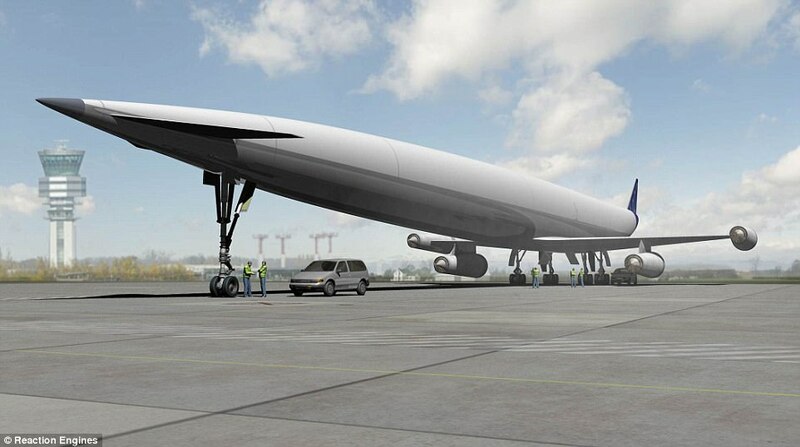 The UK site will incorporate a hydrogen/air-breathing pre-burner to condition the air for core evaluation and is adjacent to a test facility where Reaction’s rocket nozzle tests have also been conducted. The test centre will feature an assembly building, workshops, offices and a control room, along with various test engine configurations. 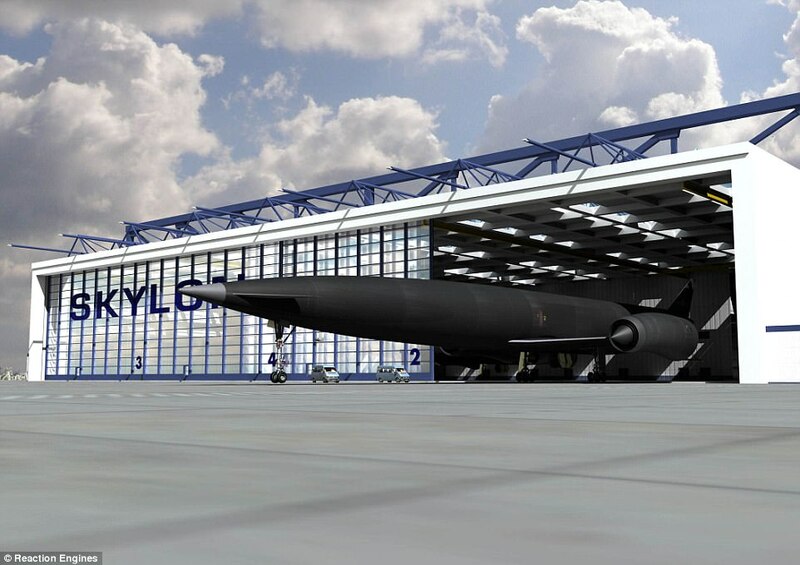 The company plans on putting the Sabre engine in a reusable spaceplane called Skylon - a vehicle capable of launching heavy telecommunications satellites. Mark Thomas, CEO at Reaction Engines, said: 'This is another exciting step forward in development of Reaction Engines' Sabre engine and a visible demonstration of the UK's commitment to the programme. The test work, which is due to start in 2018, will focus on running the HTX at airflow temperatures in excess of 1,800 deg F (1,000 deg C), representing inlet conditions in the engine at Mach 5. The HTX is designed to chill airflow down from this temperature to minus 150 deg. C. in less than 1/20th of a second, using thousands of thin-walled tubes. Franco Ongaro, Director of Technology, Engineering and Quality, at ESA said: 'The opening of this new test facility at Westcott Today marks an historical moment for the European Aerospace industry and for the UK research and development in rocket propulsion. 'This facility will enable the ground test of the Sabre engine cycle, opening the way to the first flight tests, and to a new era. 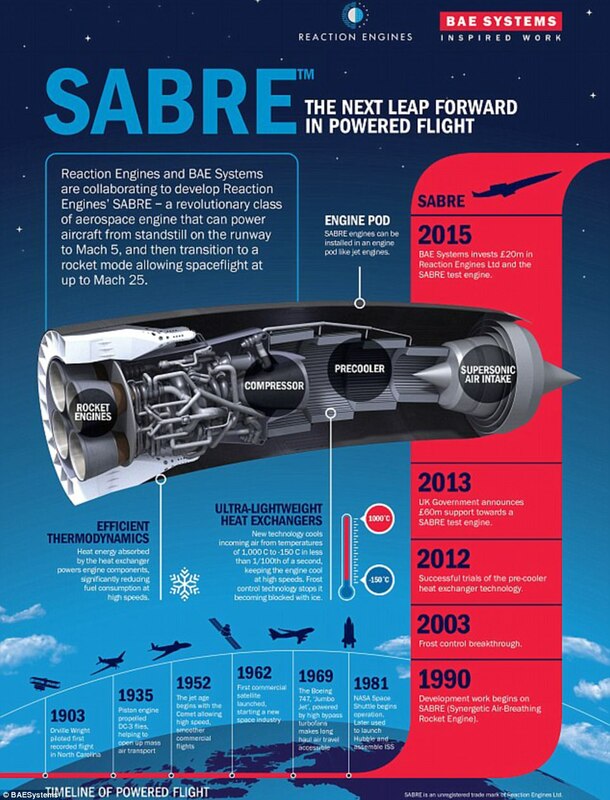 The revolutionary Sabre engine could allow aircraft to take off from a runway and accelerate to five times the speed of sound, before switching to a rocket mode, propelling it into orbit. It can then transition to a rocket mode of operation, allowing spaceflight at speeds up to orbital velocity, equivalent to 25 times the speed of sound. Reaction Engines has now has secured over £50 million ($66 million) in funding from the British government, with more than £42 million ($55 million) from the UK Space Agency, and the ESA contribution acting as the final piece. This design could also be used to send satellites into space at a fraction of the current cost. This allows the engine to run safely at much higher power than is currently possible, without the risk that it will overheat and break apart. The design – known as an air-breathing rocket engine and named Sabre – could power a new generation of Mach 5 passenger jets, called the Lapcat, dramatically cutting flying times. Mach 5 is about two and half times faster than the top speed achieved by Concorde and could be the next big leap forward in powered flight. While normal long-haul passenger jets cruise at around 35,000ft, the Lapcat could fly as high as 92,000ft at speeds of up to 4,000mph. Reaction Engine's Sabre design uses a system of pipes, filled with helium. The air passes through these pipes and the helium helps remove any heat and the oxygen is carried to the engine. Once in space, the engine is capable of switching into rocket mode. This means the craft can travel in orbit for around 36 hours and be used to launch satellites, for example. 'We want the UK to be the best place in Europe to innovate and the Sabre engine programme has the potential to change air and space travel forever,' said Katherine Courtney, acting Chief Executive Officer, UK Space Agency. 'When the UK Space Agency made its £60m commitment in 2013, we demonstrated our courage and belief in the development of this ground-breaking technology. Mr Thomas has described the development of the engine as the 'Holy Grail' of space access. He said: 'The general public may feel removed from the notion of space, but much of our lives are reliant on the use of satellites in space. 'Because of its reusability, it dramatically reduces the cost of launching a satellite to about one tenth of the current $100 million. 'You don't buy a new car, and then when it runs of fuel throw it away. BAE will be developing an aircraft fitted with the new engine. The team plans to produce a demonstration model by the end of the decade, although designs for passenger aircraft are still at least 20 years away.